Registration process will be completed online from the eligible candidates. All interested candidates can fill application form online from 24 August 2018. You can fill application form till the last date which is 13 September 2018. There are approximately total 76 posts for principal, 220 posts for Vice principal ,592 posts for PGT Teacher, 1900 for TGT Teacher, 5300 posts for Primary Teacher and 50 Post for Librarian. Vacancy notification is published for filling posts in all KVs. Senior secondary certificate with 50% marks with Intermediate and bachelor Degree in Music and Competence to teach through Computer application. Selection of the eligible candidate for the posts of Principle will be done through the written examination. Written examination will be held at various examination centers all over India. 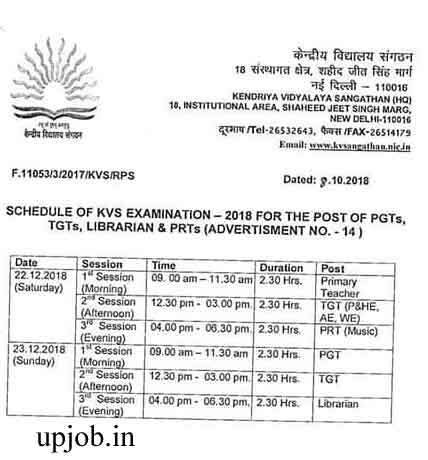 KVS will announce the examination date for these vacancies online. Upjob.in will provide you complete details of Exam schedule of all categories of the posts. After that those candidates who will be declared qualified in the written examination they will be call for personal interview test. All correspondence with candidates will be done through e-mail only. All information regarding examination schedule/admit card/ interview call letter etc. will be provided through uploading on KVS website. Application Form fee: rs 1200. Candidate can deposit application form fee via Challan form or Credit/Debit Card. no, only B.Ed passed or any other essential qualification passes student can apply. for TGT CTET is must along with 505 in concerned subject and 50% in aggregate. Kya PRT ke liye D.ED. Special Education and CTET -1 cleared eligible h ? Is diploma in special education with ctet eligible for the post of prt??? I have completed my UP BTC(Basic Teacher Certificate) course and cleared CTET also..Am I eligible to apply for Primary Teacher vacancies..as it is mention that only B.ed and B.el.ed qualification candidates can apply only...Please reply sir/mam..
Is 50% marks compulsary in intermediate for prt ? Can we fill prt form on the basis of graduation marks? Actually btc is only for up board not for cbse. So I think you cant apply. I have done BTC with CTET qualified so can I apply for the post of PRT. PLZ tell me. I have passed D. Ed. And cleared ctet paper-1. I have done B.Ed also. Am I eligible for applying PRT? Please help me. Sir i am B.ed and cleared ctet 1 can i apply for prt ? Are you sure exam will be held in August 2015? Kvs mein distance education m.sc (zoology) candidate pgt biology k liye eligible hote hein ya nhi?? Sir plz tell the exact date of PGT Examination. I haven't clear ctet but completed D.El.Ed. education !!! may I eligible for PRT in kvs exam ???? B.ed is required for PGT BIOLOGY? Sir I have given jbt 1st year exam and cleared ctet paper 1 .can I apply for PRT KVS? ? Is exam ka syllabus kya hoga? I am only 12th pass and ctet qualified . Is it mandatory that only d.ed students with above qualification can fill form for primary teacher ?? I hav cmpte be in electronics and communications n nw i m intrst to join kv. Can I? Plz hlp me out. can I apply for pgt? I have done b.ed.& ctet-2 but in graduation I could'nt done 50% due to odd conditions. I belongs to OBC also. I have passed both BEd and DEd.And also qualified Ctet1 and Ctet2.can I able to apply both PRT andTGT? I have completed B.Sc. Chemistry with Phys and Math. Can I apply for TGT science since it is mentioned one should have botany, zoology and chemistry in graduation. I have done my BSc & MSc in Electronic. So am I eligible to apply for kvs. I have no BEd. sir please give me a answer , waiting for your help. Sir actually I have already filled this application in 2015 but could not renew this application in 2016.... And now I am not finding admit card.... Its shown as invalid application Id.... What shall I do.....????? Sir i hv completed btc, and also have prabhakar degree in music so m i eligible for KVS.....please reply as soon as possible.. I have done diploma in information technology and ptt as well so can I apply for pgt ( computer science teacher ) and for PRT primary teacher? I mean can I fill two forms. PGT ka form B.Ed. appearing last sem bhr skte h kya?